Interesting factoid about Mike Riley, the HC of the San Antonio team. He was the Chargers HC from 1999 to 2001, they never made the playoffs. He was the HC of the Winnipeg Blue Bombers in the CFL before that and won a Grey Cup in 1990. At least this guy has actually taken a team all the way in the pros. Damn near 30 years ago, but still, he actually did it once. They have some good coaches. Mike Martz is the coach of the San Diego team. There will be one game televised each Saturday and Sunday on CBSSN. I have DirecTV so I get that channel as part of my service. This is being billed as a development league. I'll watch just to give me something to fill the time until next NFL season. No kickoffs, just start at the 25. 4th & 12 from your 28 to replace onside kick attempts. 4th & 12 from your 28 to replace onside kick attempts. That's interesting. Probably better odds of making that than trying to make a ball bounce all over the place and recover it. 8% recovery last year. I'll take the 4th & 12. I mean generally if you're going for an onside kick, it's because you need to score again quickly and don't have enough time to waste with your defense being on the field. So if you don't get recover it the game is all but lost anyways. How is that not NFL rejects? Do you not watch college either? Lol it is...i'm just saying if the NFL gets to the point where it's unbearable to watch, I'll go Canadian football league before i go XFL 2.0. I watch, but mostly Big 12 & the high profile games & UH games if they're on TV. I may watch a game here & there if there's a particular player i like. There are lots of talented football players that just are not NFL talent, they can put on a good show. I've always enjoyed watching these spring leagues, but they never last and I don't expect this one or the XFL to last either. However, you're not watching this league except on CBS Sports Network which you need cable or a CBS All Access subscription. They're only broadcasting one game from the opening weekend and that's all you'll see of 'em without CBS Sport Network access. There is no way they will survive like that, they need more TV time across a broader range of options. I don't see them selling the tickets they'll need to in order to keep the league afloat. Nothing about that on the AAF website. so when I was reading on their TV deal, it mentioned the games would be available on a free streaming service. So the AAF will have it's own app that let's you live stream the games for free as well as having integrated fantasy games in the app. B/R live will also be streaming 1 game a week. 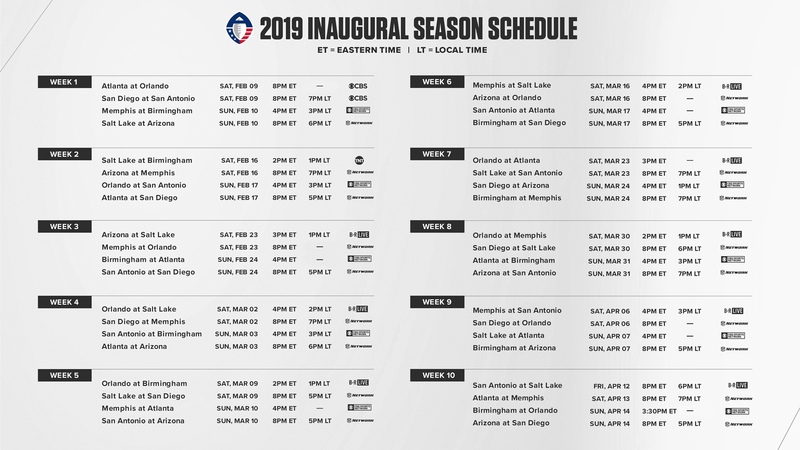 "players would earn a year's scholarship in post-secondary education for each season of play"
This page on the AAF website lays out their first years TV schedule and where you can get the games. I didn't even know that Bleacher Reports had their own sports streaming service.